Viacom has unveiled the results of “When Networks Network: TV Gets Social,” its new multi-country study investigating the relationship between TV and social media usage. The multi-country study involved social media diaries in the US, as well as online communities in the US, UK and Germany. International online surveys were conducted in the US, UK, Germany, Brazil and Russia with more than 5,000 Viacom viewers aged 13-49 who use two or more social media platforms on at least a weekly basis. Out of 24 social media activities tracked, three distinct types of motivations for TV-related social media use emerged: Functional (searching for show schedules, news, exclusives); Communal (personal branding, connecting with others); and Playful (gaming, entering contests). Of the countries included in the study, Viacom found that viewers in Brazil embrace TV-related social media activities the most frequently, while those in Germany are the least likely to do so. – access exclusive show info (37%), video (36%) and plot clues (36%). Functional motives are stronger for teens and young adults. Viewers 13-17 are most likely to use social media to search for show schedules and exclusive videos, while those between the ages of 18 and 24 are most likely to search for the latest show news and to access spoilers. Communal factors are the second most common reason for engaging in TV-related social media use. Viewers reported using social media to brand themselves and share taste (34%); to connect with the show (28%); and to connect with other fans (28%). “Liking” or “following” also satisfies functional motivations by providing show schedules and updates. 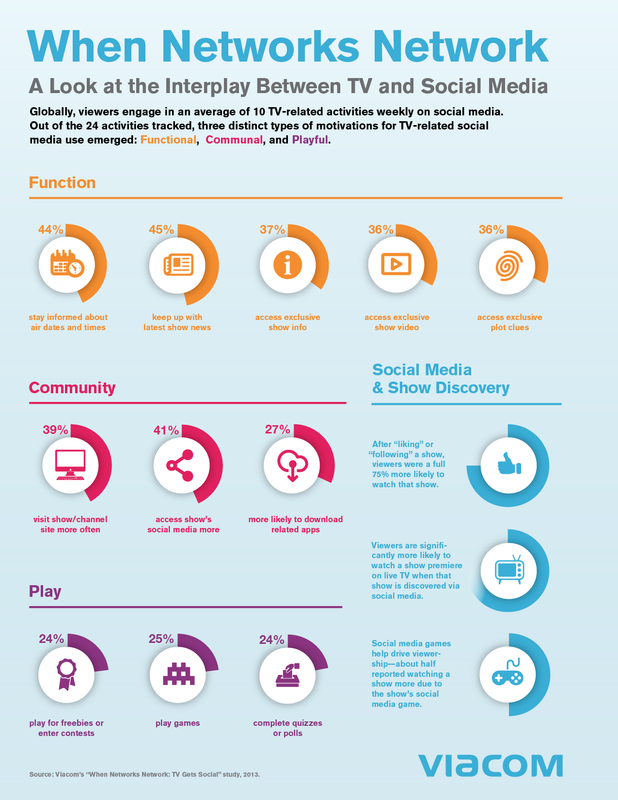 Third, playful experiences drive TV-related social media activities, including playing for rewards (24% to get freebies or enter contests) or playing games (25% games; 24% quizzes/polls). – Over 30 percent play TV show-related social media games on a weekly basis. – Of the social gamers who watch a TV show and play the related game, about 75% play off-season. – TV-related gaming is a persistent touch-point and a way to connect year-round with viewers. Social media games help drive viewership, with around 30% of respondents having gamed before ever watching a show. About half reported watching a show more due to the show’s social media game. Game shows, comedy and reality shows come in as the top genres for gaming. Social media ranked third (39%) as a source of show discovery, behind promos (54%) and word of mouth (50%). The exception is Brazil, where social media ranked even higher as a source of show discovery, second only to TV promos. The research revealed that social media-fueled show discovery uniquely and positively impacts live tune-in, with viewers significantly more likely to watch a show premiere on live TV when that show is discovered via social media. – Seventy percent are likely to watch the live debut of a show that was discovered on social media, versus 48% live if it was discovered elsewhere. – Forty-one percent are likely to watch a show live past its first season if the show was discovered on social media, versus 28% live if it was discovered elsewhere. Drivers of live tune-in from social media include Facebook friend’s comment, a show’s post, or a friend “liking” the show. This post is adapted from a press release available in full here. Click here for more from Viacom (including on social TV) on MIPBlog.